NETWORK FINALS: GREY’S ANATOMY gained 0.1 in final numbers, while THE TITAN GAMES lost the same. CABLE HIGHLIGHTS: TNT’s NBA doubleheader was at 1.04 (Lakers vs Celtics)/0.59 (San Antonio vs. Portland), with the NBA ALL-STAR DRAFT at 0.41 as a lead-in. 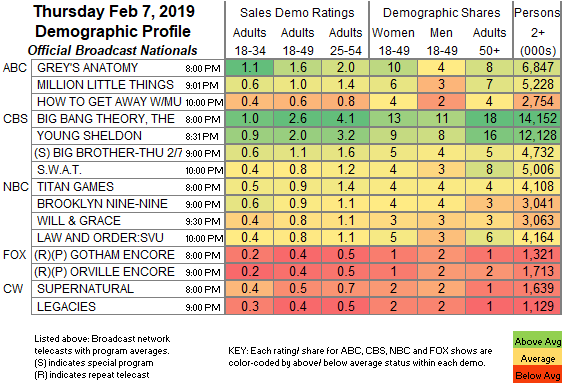 Between the two games was TLC’s august DR PIMPLE POPPER, up 0.04 to 0.79. On A&E, HOMICIDE SQUAD gained 0.02 to 0.36, 60 DAYS IN dropped 0.07 to 0.35, and FIRST 48 was up a tick to 0.34. On MTV, FLORIBAMA SHORE fell 0.08 to 0.32 (with an AFTER-SHOW at 0.22), and EX ON THE BEACH was at 0.30. On Bravo, TOP CHEF ticked down to 0.32, MILLION DOLLAR LISTING ticked down to 0.22, and BACKYARD ENVY was down 0.02 to 0.08. Nickelodeon’s late-afternoon LOUD HOUSE was at 0.31. On History, SWAMP PEOPLE ticked down to 0.31, and TRUCK NIGHT IN AMERICA was down 0.02 to 0.26. MSNBC’s RACHEL MADDOW SHOW led cable news at 0.31/0.46/3.3M, with Fox News’s HANNITY at 0.27/0.46/3.3M, and CNN’s CUOMO PRIME TIME at 0.22/0.31/1.3M. On ID, DEAD OF WINTER rose 0.05 to 0.30, and DEADLY SECRETS ticked down to 0.26. Food Network’s BEAT BOBBY FLAY climbed 0.07 to 0.29. On HGTV, HOUSE HUNTERS gained 0.06 to 0.28, HOUSE HUNTERS INTL grew by 0.04 to 0.27, and FLIP OR FLOP was up 0.07 to 0.25. 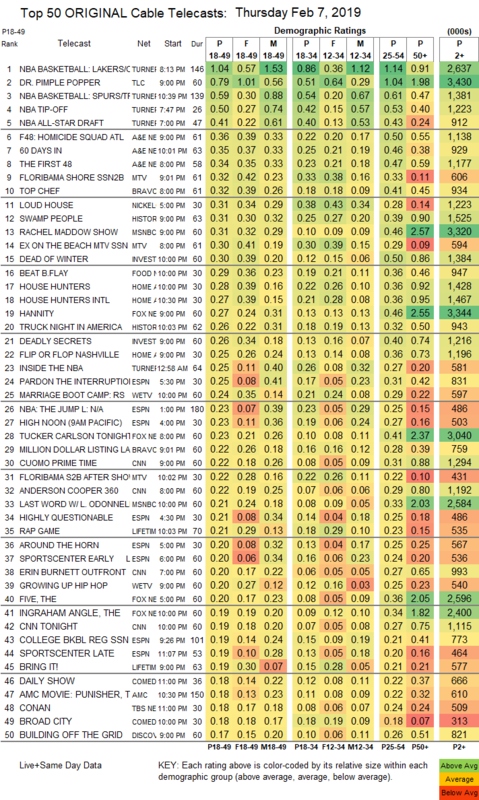 On We, MARRIAGE BOOT CAMP ticked down to 0.24, and GROWING UP HIP-HOP was steady at 0.20. On Lifetime, THE RAP GAME edged up 0.02 to 0.21, and BRING IT was up a tick to 0.19. On Comedy Central, BROAD CITY lost 0.02 to 0.18, and THE OTHER TWO was up 0.02 to 0.13. Discovery’s BUILDING OFF THE GRID dropped 0.04 to 0.17. Freeform’s SIREN fell 0.07 to 0.14. Paramount’s LIP SYNC BATTLE gained 0.02 to 0.13. Tru’s CARBONARO EFFECT rose 0.03 to 0.13, and INSIDE CARBONARO was up 0.03 to 0.11.